July 11th – Bromel Club, Bromley Court Hotel, Kent. THE ARTWOODS. There were lots of club nights organised during the 1960s for bands to play, away from the regular package tour shows. 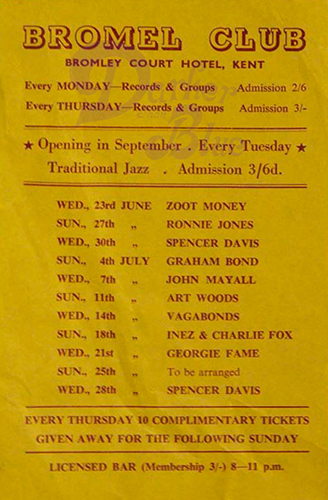 This flyer is from the Bromley Court Hotel, and they’ve gone for a mixture of bigger names, local group nights, record nights (and Trad Jazz) throughout each week. Not a bad list of attractions either, with Jon Lords’s mob turning up for the Sunday show. 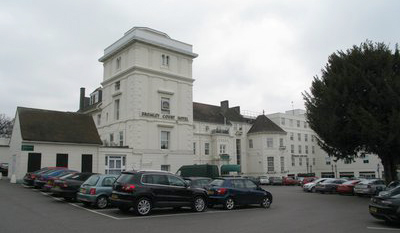 The venue (a Victorian mansion converted into a hotel in the 1930s) was south of The Thames and became a well known venue on the London circuit during the sixties. Jimi Hendrix and Pink Floyd also played early gigs here.